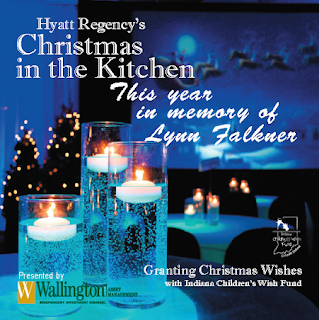 One of Indianapolis' (if not THE) top foodie fundraisers annually is gearing up for its holiday event: Christmas in the Kitchen at the Hyatt Regency downtown Fri., Dec. 11. There is no fundraiser I look forward to more than this one, folks. It's a chance to dress up, have an insider's look at the chefs' world, and give to a worthy cause, all while sipping fabulous cocktails and wine, and nibbling your way through the smorgasbord of gourmet cuisine. The Indiana Children's Wish Fund receives the money raised through tickets and an extraordinary silent auction. The event will be overseen by William Hawkins, Hyatt's executive chef. Working for a Washington D.C. congressman, a country club, and as far away as South Africa, the east coast bred chef explains why this opportunity to give to the local children means so much to him. "As chefs and cooks, it is inherently in our nature to show a great deal of pride in the work that we do and the food that we create, I think that just knowing the good that this dinner does helps to push us to produce the absolutely best over the top function we can create. It's something my cooks begin talking about as far as six or seven months in advance and we look forward to every year. Normally we work behind the scenes so this banquet is unique in that we open the doors of our kitchen to the public, we set up numerous stations around our kitchen, and we encourage our guests to interact with us, to have a look around and peek behind the curtain at what we do. There’s an awesome feeling of connection their and were extremely proud of using our talents to give back to the community that has done so much for us." Along with specialty cocktails, wines and after dinner drinks, the menu will include a wide array of gourmet meats, desserts, appetizers and seafood. Just a few items include: babaganoush, blue point oysters on the half shell, ceviche shooters, stout and citrus braised beef short ribs, smoked pork cheek, cornmeal dusted walleye, rosemary and horseradish crusted prime rib, smoked maple and Siracha brined heritage pork loin, charred herb-crusted lamb chops, mint and sorrel chimichurri, egg nog crème brulee, mint cheesecake, coconut cake, candy cane fudge and cranberry bread pudding. Festive live holiday music by Blair Clark will be provided throughout the evening. Individual tickets are $150 (admittance into the event with seating) or $100 per person (admittance into the event without seating). They are almost sold out, so get them quickly. Indiana Children’s Wish Fund, established in 1984, grants wishes to Indiana children, ages 3-18, who suffer from a life-threatening illness. To date, the organization has granted more than 3,200 wishes to Indiana children. Reservations are limited. To purchase tickets, contact Indiana Children’s Wish Fund at (317) 913-WISH or visit IndyWish.org. Elizabeth J. Musgrave is a syndicated fine-living, travel columnist, freelance writer and photographer, and performing arts and restaurant critic for Gotta Go. Read Infused, her spirits, wine & beer lifestyle column, at www.GottaGo.us and www.FoodDigital.com and catch her as Indy’s Personal Lifestyle Adviser on Indy Style, WISH8 (CBS). Gotta Go is published on www.Gottago.us, www.BroadwayWorld.com, and in print. Follow her on Twitter @GottaGo, LinkedIn and Facebook.